The Civil War and the American conquest of the West were two of the most important events that changed the United States in the nineteenth century; however, they are often treated and taught separately in history texts and classrooms. This separate categorization is hardly surprising since, in terms of geography, the majority of the Civil War took place in the southern and border states, with little military engagement in the trans-Mississippi West that occupies the focus of most western history specialists. But is also odd, given the importance of the West to American politics and identity in the decades leading up to 1861. 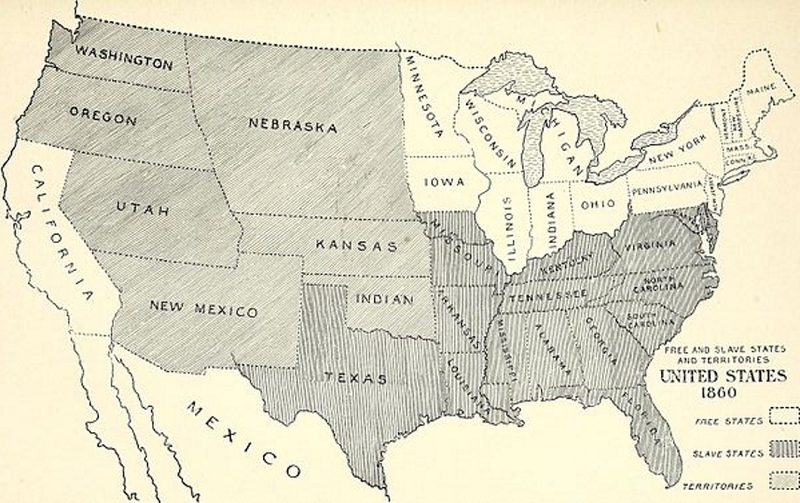 The expansion of slavery figured prominently in the power struggles for control over western territory in the first half of the nineteenth century; determining the free or slave status of incoming states and federal territorial possessions was central of the Missouri Compromise (1832) and the Compromise of 1850, the two biggest political bargains that diffused the nations heated slavery debates in the antebellum period. Westerners also witnessed these political struggles produce outright violence, including the Bloody Kansas border war (1854  1861), before war turned national. Despite the close relationship between the West and the slavery politics that produced the Civil War, once historians reach the secession crisis, which began in the wake of Abraham Lincolns 1860 election, the West disappears from the main historical narrative. Historians have recently begun a renewed effort to explicitly articulate the ways in which we might think about the Civil War and the West together, building on an earlier literature that limited the Civil War in the Far West to histories of military conflict, particularly the New Mexico Campaign (1862) and the Battle of Glorieta Pass. Anthologies like the University of California Presss Civil War Wests demonstrate the sheer diversity of scholarship a Civil War West framework can produce and join together. These collections of essays also illuminate broader themes that can help us think about East and West together  how the Civil War period raised questions about the nature and form of citizenship, witnessed many kinds of violent conflict on and off formal battlefields, and set in motion military, economic, and political events that continued well after the war officially ended. Histories that explore these themes are helping to reorient the major narratives of not only the Civil War, but will also expand our conceptions of Reconstruction practices and policies, revealing the national scope and impact of the Civil War and its consequences, as well as the periods international significance. Adam Arenson and Andrew R. Graybill, eds., Civil War Wests: Testing the Limits of the United States (Oakland, University of California Press, 2015). Virginia Scharff, ed., Empire and Liberty: The Civil War and the West (Oakland, University of California Press, 2015). * If you are near Autry National Center of the American West in Los Angeles, CA, check out their complimentary museum exhibition, Empire and Liberty, which explores the causes and legacies of the American Civil War from the vantage point of Westward expansion, on view until January 3, 2016. In keeping with the purpose and spirit of the new scholarship that combines the West and the Civil War, teachers will be best served by purposefully integrating western perspectives and sources into the larger narratives of the desired curriculum where possible. Proposed map of division of the Arizona and New Mexico Territories by the Confederacy during the Civil War, Arizona Historical Society. Among the ways western Civil War sources expand our views of the conflict, they offer important insights into the Confederate perspective and worldview, revealing the scope and nature of the Confederacys dreams for its future beyond the defeat of Union forces. With origins in various efforts to expand their proslavery order throughout the Atlantic in the 1850s, Confederates envisioned and attempted to create a transcontinental empire throughout the Southwest throughout the war. Matthew Karp, The World Slaveholders Craved: Proslavery Internationalism in the 1850s in The World of the Revolutionary American Republic: Land Labor and the Conflict for a Continent, ed. Andrew Shankman (New York: Routledge, 2014), 414  432. Walter Johnson, River of Dark Dreams: Slavery and Empire in the Cotton Kingdom (Boston, Belknap Press, 2013). Chapters 11  13 in particular form the books study of proslavery imperialism. Leonard L. Richards, The California Gold Rush and the Coming of the Civil War (New York: Alfred A. Knopf, 2007). Chapter 8 and the Epilogue are particularly relevant. Kevin Waite, Californias Forgotten Proslavery Past, History News Network, July 6, 2014.
and joining the standard of the seceshers. Sumners letter not only describes the importance of the Far West for Union military planning, but also the Confederacys fight for Arizona territory in terms of its international vision of a proslavery republic. Proposed map of division of the Arizona and New Mexico Territories by the Confederacy during the Civil War. Arizona Territory was not just the passive subject of Confederate imperialists designs. In March 1861, residents passed an ordinance of secession by convention after federal forces withdrew from the territory. Although only a Confederate possession for a brief period of time (ending July 1862), the Ordinance reveals the pressing concerns of the people of Arizona Territory: the need for protection from Indian raids and attacks, continued mail service, and the ties of southern identity. Interestingly, the document makes no explicit mention of slavery. Have students compare the Arizona Territorys Ordinance of Secession with another states declaration of secession (South Carolinas Declaration of the Immediate Causes which Induce and Justify Secession is a prime example). What are the concerns articulated in each document? Where do they overlap or diverge? What does each document tell us about the pressing realities of life in each place? Even after California joined the Union as a free state in 1850, proslavery advocates did not give up their plans to join California with the South. In 1861, once the Civil War began, a number of secessionist plots arose, including the effort to found a Pacific Republic with Oregon, allied with the Confederacy. Harpendings narrative, an entertaining read on its own, helps students connect the expansionist proslavery projects of the 1850s with secessionist efforts in the West, while the variety of conspiracies Harpending participated in attest to the importance of California to secessionist visionaries. Approaching the Civil War from the West offers fresh and relevant ways to think about the most important event in nineteenth century America. Teachers can build in western history to their Civil War units on a number of thematic orientations: slavery expansionism, southern imperialism, American continental empire, the role of regionalism, and the meaning of citizenship in the nineteenth century. But we need not bring the two estimable subjects into the classroom simply as a side-note. As historians seek to reorient the traditional Civil War narrative, teachers at all levels can play their part by integrating western sources into their Civil War curriculum and to help their students think about the conflicts international reach and national impact. In 1863, William McKendree Gwin, a doctor and one of Californias first senators, as well as a proslavery advocate, travelled to France to gain Napoleon IIIs support for a settlement project in Sonora, Mexico designed to attract pro-Confederacy Californians and launch a Mexican gold rush. In 1865, General Ulysses S. Grant and Major-General Irvine McDowell, commander of the Department of the Pacific, wrote one another discussing the threat Gwin posed to the preservation of the United States. Using the linked primary sources below, students can review Grant and McDowells correspondence and assessment of the situation. Paired with Kevin Waites article on Gwins Sonora settlement scheme, students can see how historians mobilize primary sources to craft historical narratives, gaining an understanding of another chapter of the history of the Civil War in the West, as well as the craft of historical writing. Adam Arenson and Andrew R. Graybill, eds., Civil War Wests: Testing the Limits of the United States (Oakland, University of California Press, 2015), 1. Arenson and Graybill, eds., Civil War Wests, 266. Special thanks to Kevin Waite (University of Pennsylvania) for his expertise in suggesting primary sources for a Civil War Far West syllabus. Waite is currently at work on a dissertation tentatively titled, “The Slave South in the Far West: California, the Pacific, and Proslavery Visions of Empire.” More of his work can be found here. U.S. Army Brigadier-General E. V. Sumner, Letter to Hon. Simon Cameron, Sept. 27, 1861, The War of the Rebellion: Official Records Series I, Vol L, Part 1, pp. 636. U.S. Army Brigadier-General E. V. Sumner, Letter to Hon. Simon Cameron, Sept. 27, 1861, The War of the Rebellion: Official Records Series I, Vol L, Part 1, pp. 637. Leonard L. Richards, The California Gold Rush and the Coming of the Civil War (New York: Alfred A. Knopf, 2007), 103; Adam Goodheart, 1861: The Civil War Awakening (New York: Alfred A. Knopf, 2011), 226.